The frame for the ship of the North Star suite of the is well under way. 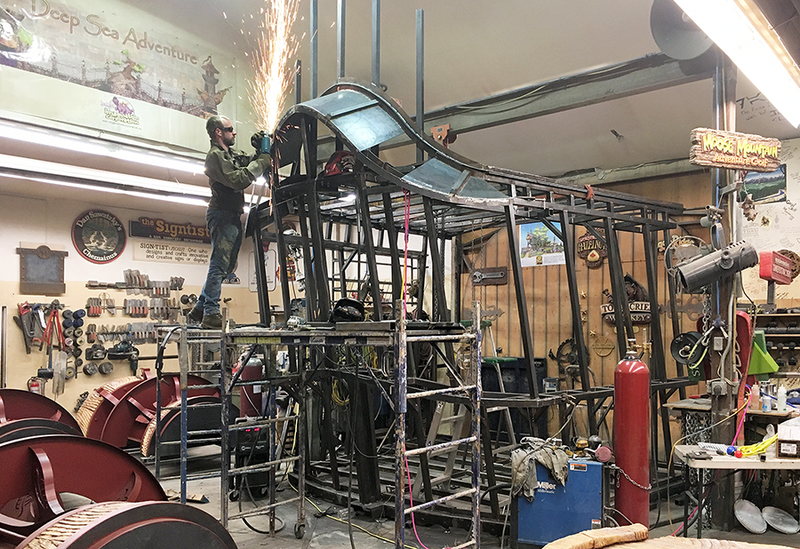 The giant, welded structural frame certainly dominates the shop and is much too large to go out of the door in one piece. There are three sections that will unbolt to get the ship out of the shop. Each has to be fabricated in such a way to ensure there is no water penetration of the building enclosure. They will be fastened together again when we do the final assembly. Peter is now in the process of welding up the roof that goes over the windows of the bedroom. There are countless angles to be calculated and measured as we go. Each of the hundreds of pieces we cut needs to fit perfectly so it can be securely welded to the assembly. This is the undoubtably the most complex feature of the entire Hazelnut Inn. It is looking pretty spectacular already. In six or seven weeks it will be time to lift the ship into position on the front tower of the inn. We are very excited and counting the days...!